Stars: Amanda Seyfried, Lily James, Pierce Brosnan, Colin Firth, Stellan Skarsgard, Christine Baranski, Julie Walters, Andy Garcia, Cher, Hugh Skinner, Josh Dylan, Jeremy Irvine, Dominic Cooper, Cher, Meryl Streep, Jessica Kennan Wynn, Alexa Davies, Celia Imrie. Mamma Mia! (2008) was a film adaptation of the successful stage juke box musical featuring many of the catchiest hit songs from popular Swedish pop quartet ABBA, and it grossed $600 million at the box office. It’s not surprising that the producers have a second bite at the lucrative box office with this sequel. Unlike many sequels though, Mamma Mia! Here We Go Again improves on the original. This is an infectious camp delight that will have audiences singing along, clapping their hands, tapping their feet and they will leave the cinema with a smile on their face. The film opens on the picturesque Greek island of Kalokairi ten years after the events of the original. Sophie (Amanda Seyfried) calls the island home and has reconciled herself to the presence of her three fathers as an important part of her life. She wants to honour the memory of her late mother Donna (Meryl Streep), who recently passed away from cancer, by turning a beachfront tavern into a glitzy hotel, which she has named the Bella Donna. But the grand opening seems to be heading for a bit of a letdown. Sam (Pierce Brosnan) still lives on the island and is supportive, but her other two fathers – Harry (Colin Firth) and Bill (Stellan Skarsgard) – are unable to attend due to other commitments. Her husband Sky (Dominic Cooper) is in New York where he is studying hotel management and seems unable to return in time for the festivities. However, her two best friends Tanya (Christine Baranski) and Rosie (Julie Walters) have managed to arrive, and through them Sophie learns more about her mother’s past. And then her hotel manager (Andy Garcia) warns that a storm is coming. The film then unfolds with a series of lengthy flashbacks to 1979 in which we meet the younger, free spirited Donna (now played by Lily James, from Baby Driver, etc) who graduates from college and heads off to travel through Europe. There she meets and sleeps with three handsome men – Harry (Hugh Skinner, from Les Miserables, etc), Bill (Josh Dylan, from Allied, etc), a handsome sailor, and architect Sam (Jeremy Irvine, from War Horse, etc) – but she is not sure which one is the father of her daughter Sophie. Editor Peter Lambert (X+Y, etc) deftly cuts between the two time frames, shaping the coherent narrative. Mamma Mia! Here We Go Again works as both a prequel, showing Donna’s carefree early years, and a sequel, showing how Sophie, herself now pregnant, tries to honour her memory. The film has been co-written by Richard Curtis (creator of Mr Bean, the classic British romcom Four Weddings An A Funeral, etc) and playwright Catherine Johnson, who wrote the original stage show and the 2008 film adaptation and while it seems contrived and cheesy, it is also sharper than the original and develops a stronger emotional connection with the characters. Curtis has sprinkled the script with plenty of witty one-liners. Director Ol Parker (writer of The Best Exotic Marigold Hotel and its sequel, etc) brings plenty of energy to the wonderfully staged and colourful musical numbers. 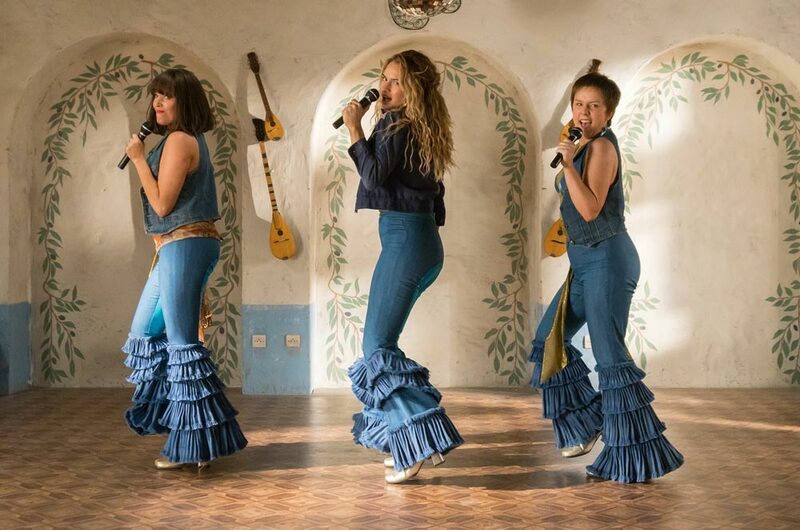 With the original film having exhausted the playlist of most of ABBA’s biggest hits having been used in the original film, one fears that this sequel would largely feature B-songs from their back catalogue are a little justified. However, some of the big hits like Dancing Queen and the titular track get another workout here and are superbly integrated into the action this time around. Musical highlights include an energetic version of I Kissed The Teacher, the staging of which recalls some of those classic screen musicals of the 60s, as well as a rousing version of Dancing Queen on a flotilla of boats with a cast of thousands, ABBA’s breakthrough hit Waterloo, and Cher’s sombre rendition of Fernando, accompanied by fireworks, which was greeted by an enthusiastic round of applause from the audience at the preview screening. And the film has been beautifully shot by cinematographer Robert D Yeoman (The Grand Budapest Hotel, etc), who captures the natural beauty of the locations (although the Croatian island of Vis doubled for Kalokairi). Michele Clapton’s 70s costume design is also spectacular. James brings plenty of peppy energy, lively spark and a suitably sassy attitude to her performance as the young Donna, and even manages to capture of few of Streep’s mannerisms and personality. Baranski and Walters steal many scenes with their bawdy humour and personalities and they are a delight to watch. Cher is great in her small but catchy role as Ruby, Sophie’s estranged, self-centred absentee grandmother who makes a grand entrance, even though she was not invited to the opening. However, Firth, Brosnan and Skarsgard seem ill at ease and uncomfortable when required to sing and dance. Their younger incarnations are much less inhibited and bring plenty of charm to their roles. There is a whole cast sing along during the finale that pairs the younger cast members with their older incarnations, which works well. Iranian actor and comic Omid Djallil (from The Mummy, etc) is very funny and brings a droll humour to his role as a dockside passport officer who passes comments on the looks of everyone who passes his booth. And keep an eye out for cameos from ABBA’s main songwriters Benny Andersson and Bjorn Ulvaes during the film. Die hard ABBA fans will love this sequel, which is better than the original. And you don’t have to have seen the stage musical of the 2008 film version to appreciate Mamma Mia! Here We Go Again to enjoy this feel good musical. Wait for the obligatory singalong version to hit cinemas in the not too distant future.